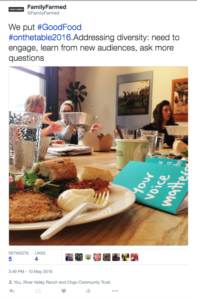 According to The Chicago Community Trust, On the Table 2016 generated more than 6.9 million digital impressions tracked through the #onthetable2016 hashtag. The exercise was part of The Chicago Community Trust’s annual “On The Table” initiative. FamilyFarmed joined more than 55,000 Chicagoans, who convened around nearly 3,500 tables across the city answering similar questions. The goal is to help create a more unified Chicago. FamilyFarmed staff, consultants and Board members all engaged in a lively conversation during our lunch hour. We shared stories of well-intentioned but ultimately unsuccessful attempts at including new groups in our events and outreach. As the conversation grew and expanded, heads nodded in agreement and a direction started to unfold. At FamilyFarmed, we couldn’t agree more. We wanted to tackle the issue of lack of diversity in our community, because Good Food is critical to every person’s health and wellness. Access to locally grown and responsibly produced food enhances the social, economic, and environmental health of all of our communities. And if we don’t understand how to bring all sides of the city to the table, we need to ask. Going to new areas of the city and asking questions such as “What can we do to make Good Food valuable?” and “How do we support you?” became the first step in our planned process. 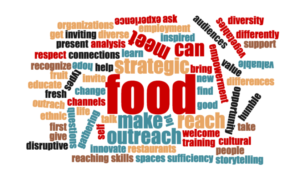 A word cloud based on notes from FamilyFarmed’s “On The Table” session. We found the core function of the On The Table exercise to be so valuable, we plan to essentially repeat it a number of times throughout the year. We will listen, learn and engage with new groups on all sides of our city in order to strengthen the Good Food community. When the Good Food world is united, we are confident this positive change will benefit the Chicago community as a whole. This entry was posted in Food and community, Healthy eating and tagged Chicago Community Trust, diversity, FamilyFarmed, Good Food community, On The Table 2016. Bookmark the permalink.